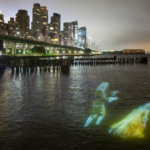 In multimedia artist Tony Oursler’s site-specific installation Tear of The Cloud, commissioned by the Public Art Fund (PAF), five video projections converge onto the gantry of Manhattan’s landmarked West 69th Street Transfer Bridge and its surroundings in Riverside Park. 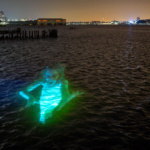 The images that unfold at the banks of the river comprise a nodal network of symbols, texts, and figures from both reality and myth to establish a vertiginous system of ideas and themes that illuminate the complex and still-evolving past of the Hudson River Valley. 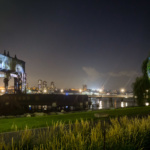 The histories and historiographies of this region have been a site of recurrent interest for Oursler since his first mature efforts in the early 1980s. 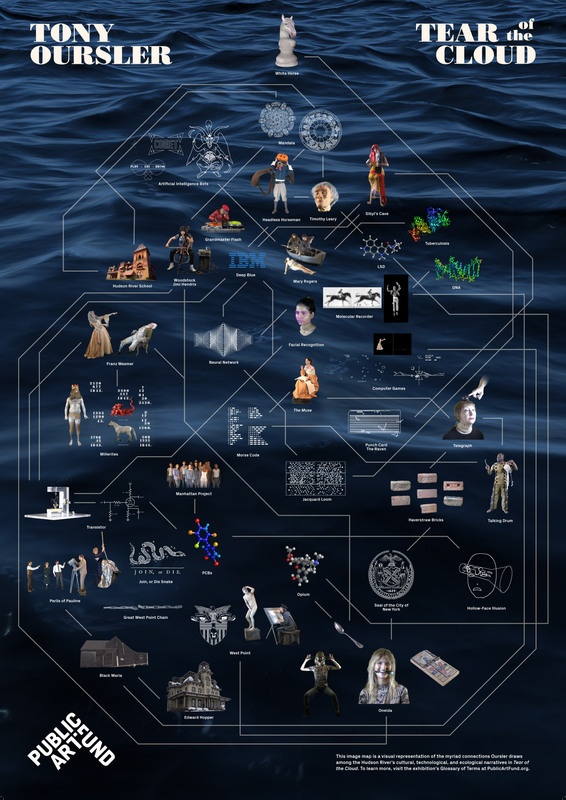 Illuminated by a flowchart designed by the artist and displayed on one of the five projection booths that surround the gantry, the subjects of the video sequences range from the Headless Horseman to Timothy Leary, Morse code, the 19th-century utopian community Oneida, digital facial recognition technology, and the Manhattan Project. Approached from the south, dreamy music accompanies the crouched bodies of various youths crawling across the trusses slanting into the water. This soon gives way to the disembodied faces of various actors reciting characteristically enigmatic phrases written or found by the artist. 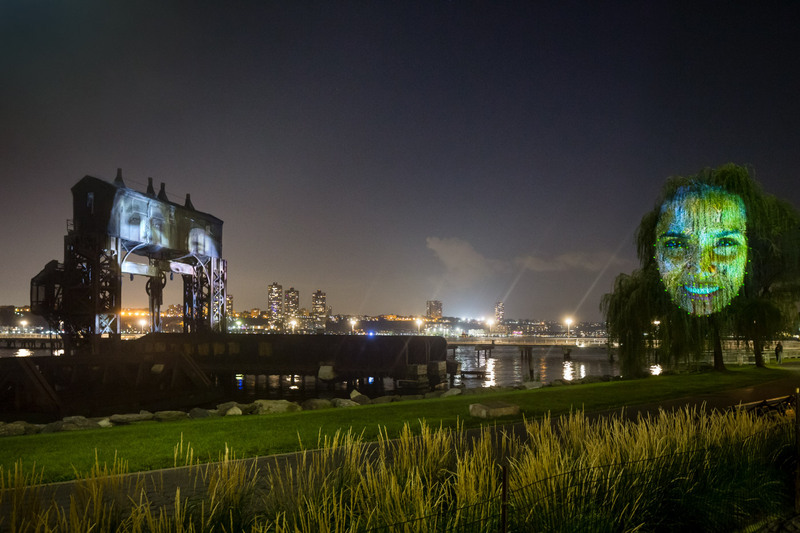 To the right, a weeping willow gently bends toward the river, its swaying branches animating a montage of sequences projected onto its foliage. 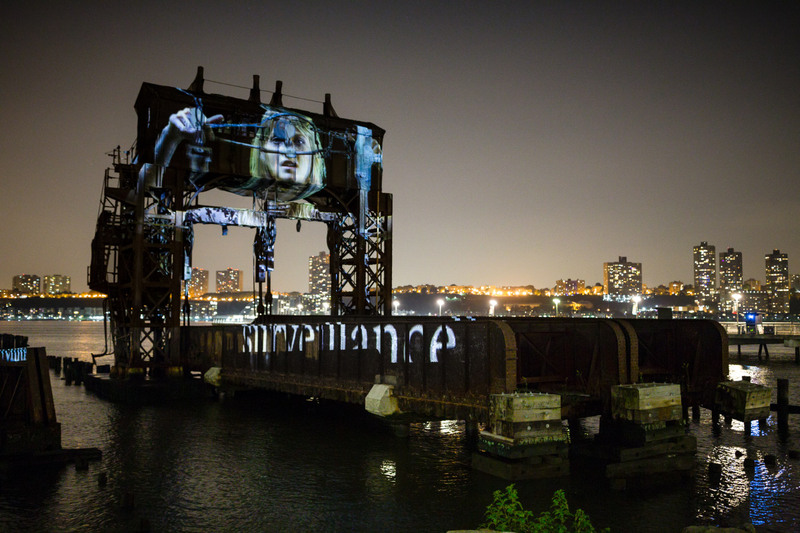 The primary structure of the bridge acts as the support for the most extensive section of the work, where a series of scenes describe the evolution of various systems of information distribution across the last few centuries. 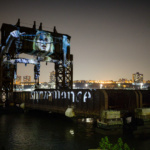 This theme is apt, as the bridge, which was built in 1911, once functioned as a dock that assisted the transfer of railroad cars to the barges that connected Manhattan to the Weehawken Yards in New Jersey. 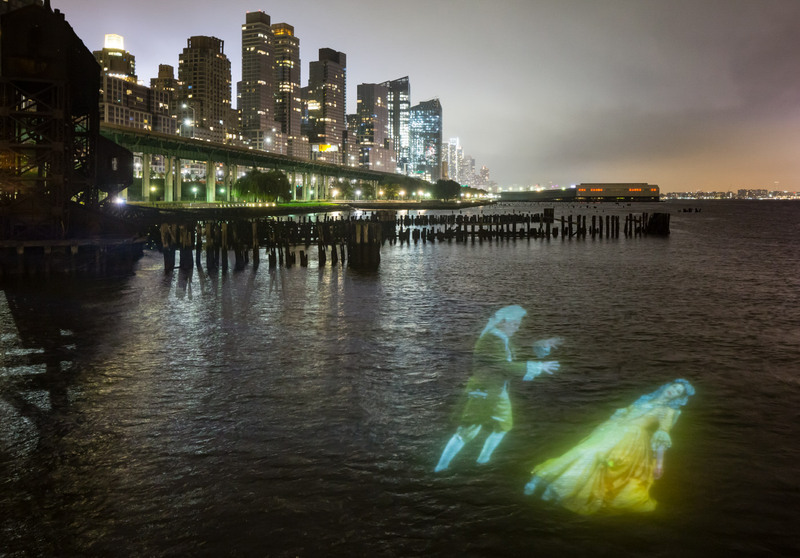 To the north of the structure, a projection onto the salty waters of the Hudson is visible—and audible—from the pier, providing deeper insight into some of the characters who inhabit the scenes projected onto the gantry. For example, we learn that Dexter and Sinister are the problematic names of a sailor colonist and a Lenape Native American, respectively, who uphold the 1915 official Seal of the City. 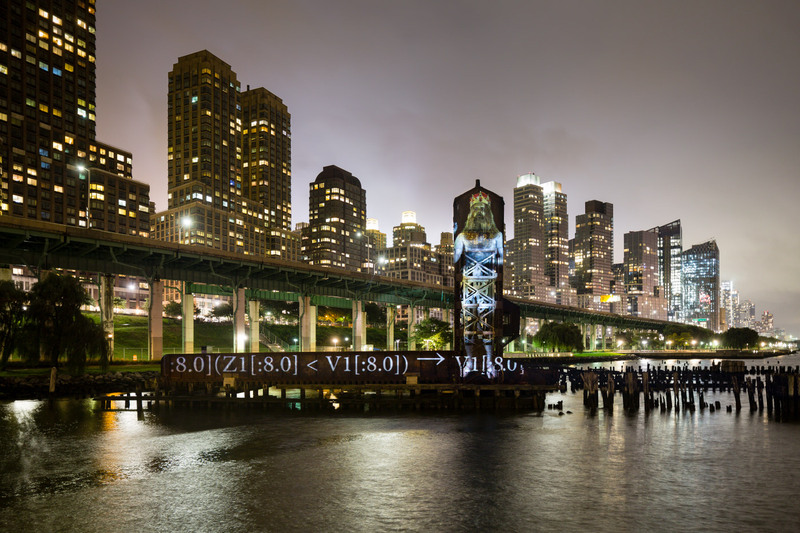 The northern face of the gantry provides a portraiture-type space for some of the most primary characters in Oursler’s repertoire, including the figure that heads his flowchart: an anthropomorphic white horse head in the form of a knight chess piece. “Reprogram is everything,” she states, reciting a series of chess moves as her image slowly slips off the gantry’s supporting beams. Manifesting the flow of information through a site designed to aid the shipment of raw materials, Tear of The Cloud embodies the rhizomatic complexities of the present moment through the archival impulse that brings us the region’s past. 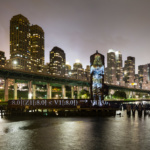 Tear of The Cloud is on view Tuesday through Sunday from 7:00 p.m. to 10:00 p.m. in Riverside Park through October 31. 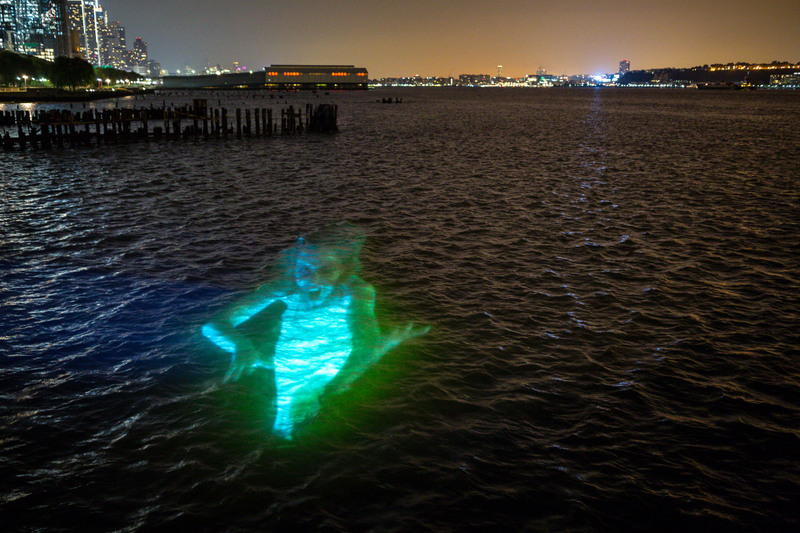 The artist will discuss the work during a talk at The New School’s Tishman Auditorium on November 1.